The sounds of guns echoed throughout Al-Assad Library Book Exhibition in Damascus, Syria. The guns weren't tangible, but virtual. The conflict, however, was from real life. It was late 2000, and a crowd gathered around the television set that was running first-person-shooter Under Ash. The game's designer, Radwan Kasmiya, thought all those long hours he and his team of five put into the game were going to pay off. Kasmiya seemed to have a hit on his hands. The controversy it sparked, about who you can play in a video game — who you can be, and at whom you can shoot — echoed a decade later, as American publisher Electronic Arts took heat this summer for letting its customers pretend to be the Taliban, aiming at U.S. soldiers. EA has since backed off, but a decade ago Kasmiya was confident in what he wanted to express in his game. During the turn of the century, Middle Eastern gamers were playing much of the same titles that their Western counterparts were. But titles like the Delta Force games were not made with Middle Eastern players in mind. "Those games demonized Middle Easterners," Kasmiya tells Kotaku from his office in Damascus. Thirty-seven-year-old Kasmiya grew up gaming, spending afternoons in arcades and on the computer. While still in his mid-20s, he was carving out a living making multimedia software for book publisher Fikr ("Thinking" in Arabic). Kasmiya was itching to make the leap from making multimedia CD-ROMs to computer games and was able to convince Fikr to fund his first game. "I'm not sure they even knew the difference between a multi-media CD and a computer game," says the designer. Kasmiya did. And he knew going into the Middle Eastern game market would be an uphill challenge. Piracy was rampant, and concepts like intellectual property were tossed to the wind. But Kasmiya believe he could deliver something that Middle Eastern players wanted — and something that they needed: a game made by a Middle Eastern designer for a Middle Eastern audience. The result was 2001's "Under Ash." The game follows a young Palestinian named Ahmad who stands up to the Israeli occupation of Palestinian territory during the First Intifada. As the BBC pointed out, the game ends if Ahmad gets shot. If he shoots civilians, the game is over. The 12-hour game features no medic packs. If you get shot, you're shot. "It's not a violent game," he is quick to point out. "You don't see blood and guts everywhere." The game is not easy, but then again, neither is the situation in Palestine. In the end of the game, there is no reclaiming territory and Ahmad cannot win. While Middle Eastern gamers could easily download pirated versions of the game, many chose to support the title and pony up for full price. The game, and its sequel Under Siege, were hits, receiving localized versions throughout the Arab world and selling somewhere between over 500,000 and one million copies each. The sequel followed the Second Intifada. Make a game about Westerners fighting Arabs, and the vast majority do not bat an eye. Make a game about Palestinians rebelling against Israelis, and people make a big stink. "If you make a game about Palestine and Israel, it's bad," Kasmiya says of how the Western media initially responded to the title. "The news likes to put a fire underneath stories." There have been claims that both Under Ash and Under Siege are propaganda — something that Kasmiya denies. "These are indie games, not propaganda," he says. Kasmiya has been lambasted from both sides, with both hardline Israelis saying that his games depict propaganda and hardline Palestinians saying that his games do not depict enough propaganda. Kasmiya says he's trying to send a message to both camps and create an interactive experience of history. His Under Siege, for example, is entirely based on events recorded by the United Nations. "If you don't like your reflection in the mirror," says Kasmiya, "don't blame the mirror. Blame yourself." 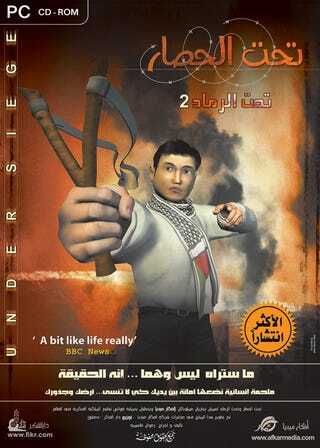 Kasmiya's aim was to do more than simply an Arabic version of Delta Force. "You can't just switch the characters," Kasmiya says, "and make the good guys the bad guys and the bad guys the good guys." Middle Easterners, he says, are too clever for that. His goal was to tell a story. "If you compare my games to a triple-A shooting game, I lose. What I can do is create a unique story." The story of Ahmad resonated with Middle Eastern gamers. The conflict was real, and it was tangible. The conflict in Afghanistan is also very real and very tangible. Electronic Arts initially planned to include Taliban fighters as playable characters in the game's online mode, but has since decided to drop the Taliban fighters. Kenneth Hawes, director of the U.S. Army's Public Affairs Office Western Region, told Kotaku that when a military shooter has an online element there needs to be "theoretical good guys and theoretical bad guys." "This isn't new," Kasmiya says of the ability for gamers to play as the "bad guys". "But the families of the troops might be more sensitive to this feature," Kasmiya says, echoing the sentiment of Hawes. Kasmiya, who is a fan of first-person shooters like Medal of Honor and Call of Duty, says that games do have the ability to cross the line. "Call of Duty: Modern Warfare 2 didn't cross the line," he says of the infamous airport scene. Players did not have to shoot innocent civilians, and the events swirl around a player as if he were partaking in an interactive film. The fact that the player ends up being a pawn makes the scene all the more profound. "The media created that line," he adds. For the U.S. Military, Medal of Honor did cross that line. "It is a virtual line," says Kasmiya, who is currently at work on a pair of MMORPGs. "That virtual line is in the mind." It just depends on where that line is drawn and who is doing the drawing.